The U.S. Supreme Court has rejected an appeal in which veterans sought to hold private companies responsible for their use of open-air burn pits that have been linked to scores of often fatal illnesses, from cancers to neurological damage. The high court let stand an appellate court ruling that decided more than 60 separate lawsuits could not move forward. The law firm Motley Rice, LLC, representing plaintiffs in the case, issued a statement to Military Times Monday morning. Motley Rice attorney and Army veteran James Ledlie told Military Times that KBR’s defense argued that the only way to control actions by contractors was through military oversight. But, Ledlie said, that would put an enormous burden on the limited number of military staff available to oversee sometimes complicated contractor work in combat zones. The high court decision ends this litigation but, more importantly, it could give contractors an argument on which to lean in future cases regarding negligence or harming troops, he said. However, Ledlie remained optimistic for future cases that might raise this same question. “The decision in this case is limited to the facts of this case, and in this country there has been a long history of access to the courts to address acts of negligence, even those that touch on the military, and I would hope that the courts would remain open to that history,” Ledlie said. “It’s been nearly a decade since we began advocating for those service men, women and widows plagued by this generation’s Agent Orange. We are living proof of the damage already done. We demand accountability. As Americans it is our moral obligation to care for the war heroes and contractors affected, many of whom were veterans,” wrote Rosie Torres, spokeswoman for the nonprofit Burn Pits 360. “While veterans endure illnesses such as brain tumors, lung diseases, toxic brain injury and cancer, our government has decided to leave our fate at the hands of Congress. While families bury their loved ones as a result of tax payers dollars poisoning our troops, we are now left to fend for ourselves,” Torres wrote. Improving the registry so that it can be an effective tool for research, monitoring and identifying the health consequences of these exposures, to include mortality. Conducting more and better research into the health consequences of these exposures and to develop effective treatments to improve veterans’ health and lives. Establishing evidence-based clinical practice guidelines and a specialized care program for respiratory and co-morbid conditions, including pre- and post-deployment pulmonary function testing. Creating a scientific federal advisory committee related to these exposures and health outcomes. Improving VA disability compensation claims for afflicted veterans, including establishing presumption of service-connection for debilitating symptoms and diseases that have been linked to these exposures. KBR and Halliburton attempted to have the case dismissed but failed. The Supreme Court declined to hear the case in 2015, before the most recent ruling was issued last year. 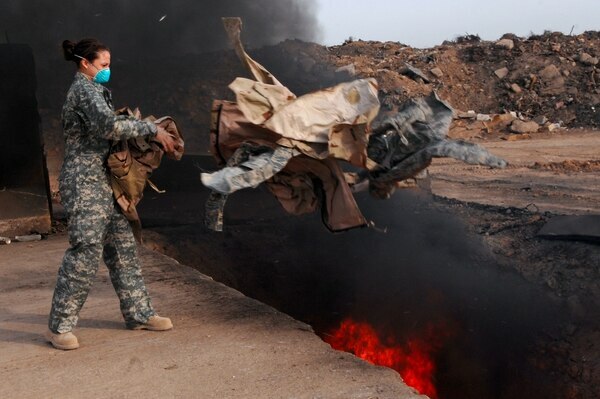 Though burn pits were in use as early as during the invasion of Iraq and continued to be used in both Iraq and Afghanistan through most of the duration of the wars, guidance that such pits should be placed far from areas near troops wasn’t published until 2011. The Department of Veterans Affairs estimates that 3.7 million veterans and service members were exposed to the toxic fumes from burn pits in both theaters. And links remain elusive because burn pit sites, and what was burned in them, have not been made readily available or such information has not been recorded accurately. 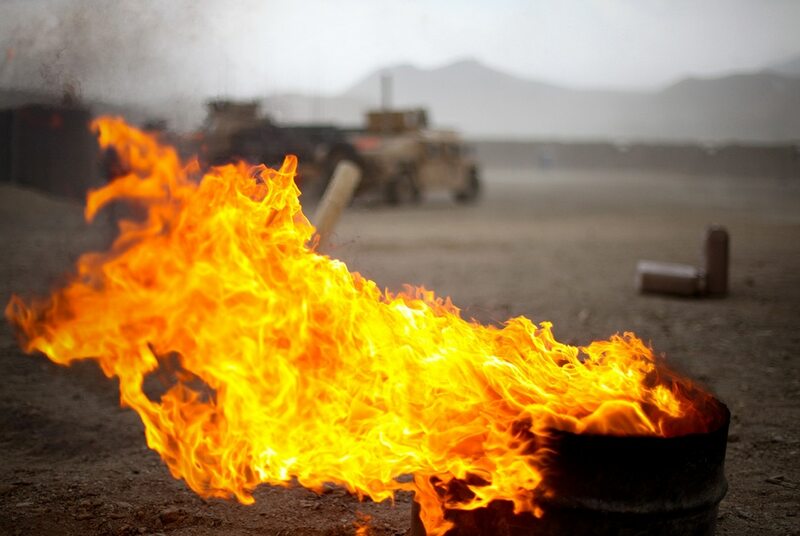 The Protection for Veterans’ Burn Pit Exposure Act of 2018 remains in subcommittee. It would have the VA presume service connection for veterans with illnesses related to open burn pit exposure. Asthma, breathing restrictions, cancers, chronic bronchitis, recurring infections, cramps and severe abdominal pain, diarrhea, leukemia, lung cancer, nose bleeds, pulmonary injuries, bronchiolitis, severe heart conditions, severe headache, skin infection, sleep apnea, throat infections, ulcers, unexpected weight loss, vomiting, and weeping lesions on extremities. Information from the Associated Press was included in this article. by Tara Copp , 1/25/2019. The Navy’s announcement Thursday that it would deny 4,400 claims from Marines and their families who say contaminated water at Camp Lejeune caused cancers and other serious illnesses raised the question of whether any affected military community could ever be compensated for the ailments they now face. On Thursday, Navy Secretary Richard Spencer said that despite the Navy’s acknowledgement there were harmful cleaning solvents and fuels that may have been connected to cancers found in Camp Lejeune personnel from 1953 to 1987, he decided this week to deny claims from those Lejeune lawsuits. In all, the claims sought $963 billion in damages. Spencer’s announcement seemed to end the families’ quest — at least on the military front ― to seek damages. Spencer cited three reasons the Navy decided to deny the claims: That recent court decisions found the contamination at Camp Lejeune, North Carolina, did not meet the conditions to grant a waiver to allow affected members to sue the government under the Federal Tort Claims Act; that service members themselves could not sue because of the Feres Doctrine; and that the spouses and dependents of service members who could have sued the government for their own cancers have likely passed the time frame in which they could have filed a case. The Navy has been considering the Camp Lejeune issue for 20 years. Service members and defense civilians who served at other contaminated bases worried that the Lejeune decision will set more precedent. Scores of Patrick residents died young from various forms of cancer. The Navy’s announcement, to Emery, is the latest sign that the military’s protections through the Feres Doctrine and other exemptions have meant “they are literally getting away with murder. They’ve known it and refuse to do anything about it,” Emery said. Frank Vera, a former weapons systems specialist at the contaminated and now closed Superfund site George Air Force Base in California was similarly critical. A community of cancer survivors at both bases have evolved, with people wondering what the military knew, and what it can do to help now. “DoD routinely uses the letter of the law to circumvent the intent of the law to conceal the mistakes of the past,” Vera said. But Congress may be stepping in. On Friday, Rep. Jackie Speier, D-Calif., announced her personnel subcommittee would be looking at potential legislative fixes for the Feres Doctrine, which could have broad implications for the military’s ability to sue the government when injured. Spencer stressed that the service members will still have full VA assistance for treatment for Camp Lejeune-related illnesses. But as far as what other remedies might be available, particularly for spouses or children of service members who grew up at Lejeune, the Navy secretary didn’t know what they might be able to do besides potentially work with Congress on a solution. That still leaves the lawsuits. On Friday, attorneys for some of the plaintiffs in the Camp Lejeune cases said the Navy’s announcement would have a chilling effect on other communities’ efforts to seek compensation, which may have been the intent. The Navy’s announcement that “’We will not be paying our claims’ — that alone is going to deter people from filing a claim that they may have,” said Daniel Maharaj of the Whistleblower Law Firm, which represented some of the Lejeune clients. Hundreds of communities across the U.S. face groundwater contamination from chemical compounds that were used in military firefighting foam and are linked to cancers, birth defects and other illnesses. The Navy’s decision on Lejeune should not keep those communities from moving forward, said Natalie Khawam, the founder of the Whistleblower Law Firm. “File the claim. Despite what the news of the day is, that’s not a court decision. Don’t let a non- court decision out there deter you from filing your claim,” Khawam said. Even if those communities proceed their own lawsuits, their priority should be making sure the illnesses they are facing get linked to their service at a contaminated base, said Michael Hoffman, an attorney at Gordon & Partners who also represented Lejeune plaintiffs. Hoffman said his firm represents veterans as their claims are heard by a VA’s review board, and has recently been working to get additional illnesses included for treatment, such as adding mental health assistance. 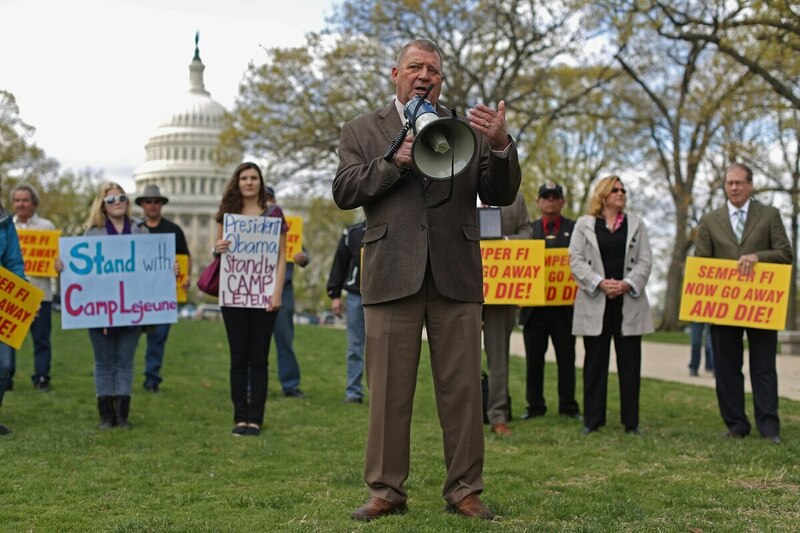 Hoffman said moving forward, he doubts there will be a case like Camp Lejeune, where it is been difficult to connect potential illnesses to government negligence, because of a lack of documentation which could have helped the veterans. “I think in the future it will be a lot easier” to prove the negligence, Hoffman said, “Because records are a lot harder to make go away” now that they are all electronic. Other affected service members, such as women who were told “Don’t get pregnant at George Air Force Base” in the 1970s and 1980s have previously told Military Times their medical records have been lost entirely, or have missing files.